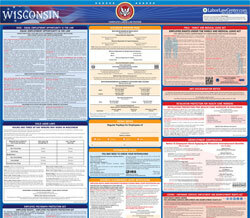 The Fair Employment Law (Spanish) is an equal opportunity law poster by the Wisconsin Department Of Workforce Development. This poster is mandatory for some employers, including all employers who employ spanish speaking employees. This poster, written in Spanish, must be posted in a conspicuous place by all employers in the workplace so Spanish speaking employees can see it. This poster describes how some employers discriminate against employees and job applicants and how on what basis as well as state that discrimination is illegal. It appears you don't have a PDF plugin for this browser. Please see the link below to download wisconsin-erd-4531-s-p.pdf.